In 1973, James Brown, having renamed himself “Godfather of Soul,” was at a crossroads: younger acts, nurtured by his original funk, were on the rise. His hits were not coming so fast; his tours were suffering. He responded with some of the nastiest, longest-lasting funk he’d ever unleashed: “The Payback.” “Same Beat.” “Stoned To The Bone.” “My Thang.” “Funky President,” now a classic sampler’s staple. And much, much more. It’s all documented on The Singles Vol. 9: 1973-1975, the latest entry in the long-running James Brown series from Hip-oSelect. com. The Singles Vol. 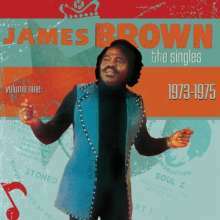 9 includes 35 tracks from the prolific JB, featuring not only the hits mentioned above, but singles by tracks he produced and is prominently featured, by Lyn Collins and Fred Wesley & The J. B.’s. The 2-CD set also includes several singles scheduled for release that were not ultimately issued, such as “I Got A Good Thing,” an early prototype of “Stoned To The Bone.” Also on that list is “Let It Be Me,” a duet with Collins reflecting Brown’s fascination with Latin rhythms. As with the eight previous volumes, the collection includes a thick booklet stuffed with rare photos, reproductions of memorabilia, an essay by former James Brown staffer Alan Leeds, and detailed track annotations.